It seems like good-news health care stories are rare these days. But for Californians with serious illness, here’s a reason for optimism: The availability of palliative care has grown substantially in our state over the past four years. Palliative care is a medical specialty focused on reducing the stress and suffering of serious illness for patients at any age and stage of disease — often provided right alongside disease-directed treatments. It has been shown to improve the lives of patients and families, align the care people want with the care they get, and reduce use of high-cost, low-value health care services. The growth in palliative care is a consequence of positive changes in policy at the state level and among health plans and health care systems. California Senate Bill 1004 (SB 1004), a newly implemented law requiring Medi-Cal managed care plans to provide access to palliative care, has helped to stimulate the development of specialty palliative care services in areas that previously had none. Since SB 1004 was enacted in 2014, the California Department of Health Care Services, Medi-Cal managed care plans, and palliative care providers have been working hard to prepare for the law’s implementation in January 2018. In addition, health systems like Kaiser Permanente, Providence St. Joseph Health, and many of California’s public hospitals have been engaged in organization-wide efforts to expand access to palliative care. We have a long way to go before Californians with serious illness have reliable access to palliative care, but the state is definitely moving in a positive direction. These efforts appear to be paying off. In 2014, the California Health Care Foundation assessed the supply of specialty palliative care programs compared to the estimated need for people in the final year of life. That research found these services could meet less than half of the estimated need, with uneven distribution across the state. The recently released update to this work, Narrowing the Gap: Palliative Care in California, reported dramatic increases in the numbers of palliative care programs and patients served, along with broader availability of programs statewide. 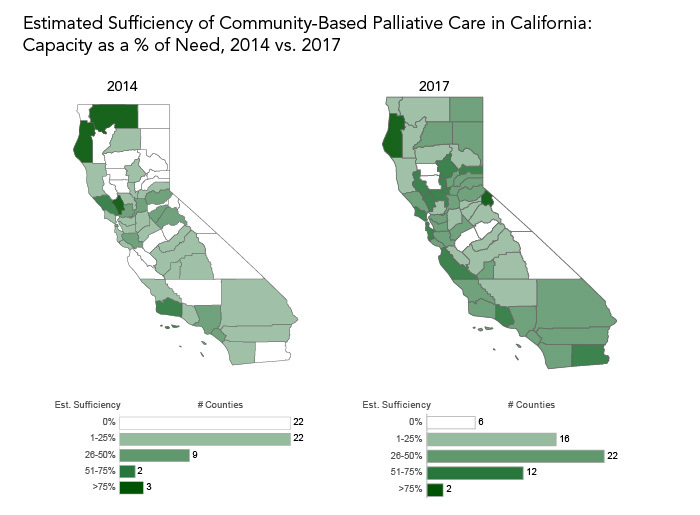 California’s inpatient palliative care capacity is now sufficient to meet 43% to 66% of the need, while community-based capacity meets 33% to 51% of need, the report estimates. In 2014, 22 of California’s 58 counties had no community-based specialty palliative care services, while today all counties have at least some access to these services. Still, important gaps and challenges remain. Despite enormous growth in community-based programs, in 24 counties the supply is only sufficient to meet 30% or less of the estimated need. Inpatient palliative care is much more readily available in urban areas than in rural areas. Even so, in many urban areas these services can address less than half of the estimated need. Smaller hospitals are less likely to have palliative care than larger hospitals. And although inpatient palliative care is now quite common across the state, the researchers found that only 11% of for-profit hospitals had palliative care services. So while program numbers and capacity have grown, eligible and appropriate patients aren’t always able to get the services. Their insurance may not cover it, or even if it does — as is the case with Medi-Cal — primary care or specialty providers may not refer their patients to these services. These providers may not know that a palliative care service exists in their area, or they may not know how palliative care can help their patients. Even today, many providers and patients do not understand how palliative care differs from hospice care, a misunderstanding that unfortunately reduces use of services that support both patients and referring providers. Kate Meyers is a senior program officer with CHCF’s High-Value Care team, which supports policies and care models that align with patient preferences, are proven effective, and are affordable. Her work focuses on improving care and quality of life for people with serious illness. Before joining the foundation, Kate worked for eight years as an independent consultant managing initiatives to expand access to community-based palliative care in California and to spread the lessons learned by pioneering organizations involved in this work. Prior to that, she worked at Kaiser Permanente in roles focused on improving the care of older adults and reducing racial and ethnic disparities in health and health care. Her professional background includes work in self-management support for chronic conditions, integrated care for opioid overuse, and maternity care. Kate received a bachelor’s degree in history from Colgate University and a master’s degree in public policy from the University of California, Berkeley. With Telehealth for the Seriously Ill, Context Matters, Paying Our Respects to the Queen of Soul, Aretha Franklin, What’s Different About Caring for Medi-Cal Members with Serious Illness? Kathleen Kerr is a health care consultant in private practice in Mill Valley, California. Her work is focused on promoting the development of sustainable, quality palliative care programs. What’s Different About Caring for Medi-Cal Members with Serious Illness?